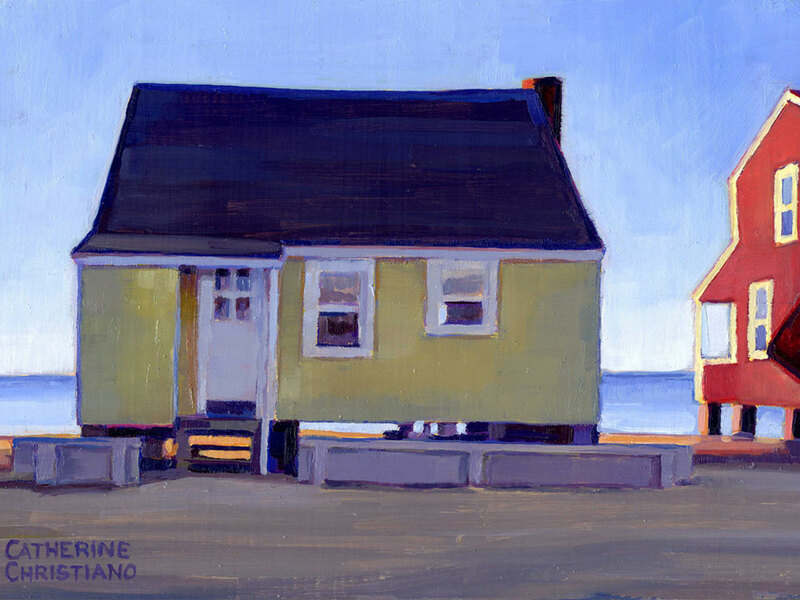 Catherine will be participating in the Summer Group Show at the George Billis Gallery in Chelsea from July 10th through August 4th, and her reproductions will be available at the Florence Griswold Museum during the Old Lyme Midsummer Festival on 7/28. 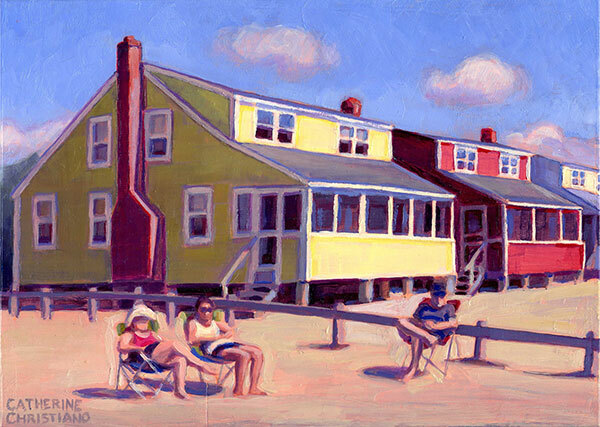 Also, see her work on display at the Hoxie Gallery at Westerly Public Libary’s current exhibition. After twenty-three years in my studio that is located over a garage, I decided it was time for an update. Tapping into my technical and design skills, I drew up plans that included adding a large dormer with a bank of windows for north light, new lighting, and lots of storage. While the roof was literally cut away, I decamped for a temporary winter studio at Hawk’s Nest in Old Lyme. 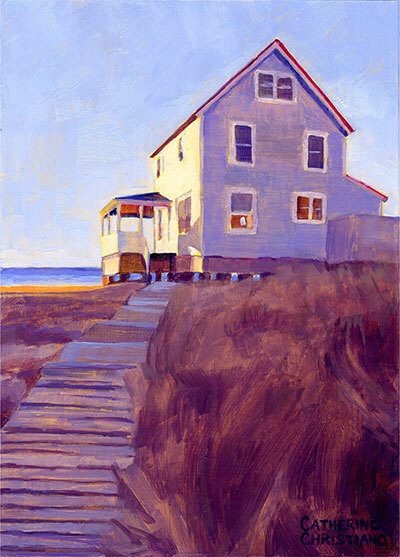 Hawk’s Nest is a seasonal beach community that I have returned to a number of times over the years to paint its houses perched on the edge of Long Island Sound. My past vantage point was always as a passerby, as someone ambling along the beach for an hour or two with camera in hand. This winter however, I was inside looking out. 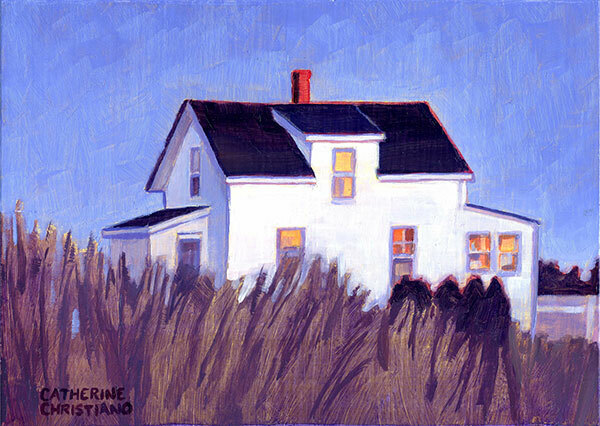 The houses that have been my subject matter for years were all around, outside every window as I moved about the cottage. I was able to observe the ever-shifting light day after day, sunrises to sunsets, and finally understood first-hand its qualities that drew the Impressionists to Old Lyme so many years ago.